Ogemaw County Clerk staff are available in the Clerk's office to handle searching for divorce and naturalization indexes for genealogists, however researchers are allowed to search through death records, and birth records older than 110 years themselves without staff assistance. Death and marriage records are both listed from 1876 to the present. Space constraints prevent more than two researchers from perusing indexes at one time, and all visitors must fill out the "Procedures Governing the Inspection of Vital Records Documents" form, which is provided at the office. 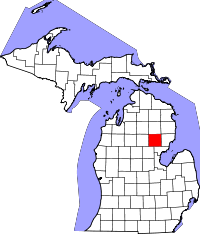 Ogemaw County also provides a Vital Certificate Request Form which can be mailed in along with the $10 fee to the Ogemaw County Clerk, 806 W. Houghton Ave., Room 101, West Branch, MI., 48661. In addition to checks and money orders, Ogemaw County also accepts credit card payments after individuals contact the County Clerk office and obtain the correct information.